We will assist you in training your alpacas to walk on halter/lead or for the show ring, either on your farm or agisted at our farm. Training can take from 1-10 lessons, depending on the alpaca's personality - done in a stress free environment, at the alpaca's pace in order to get the best results. If done on our farm, we do 14 lessons, once daily - approx half hour per day. - We do not train pregnant females, only empty females and all males. 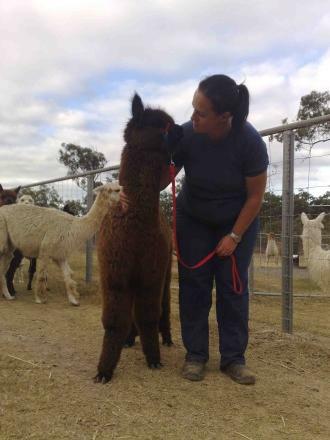 Training at Our Farm: Agisted 2 x weeks, $120 per alpaca, includes feed and general husbandry.